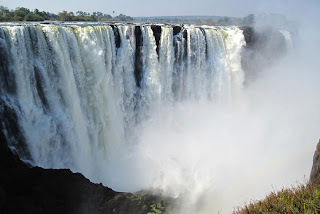 The Victoria Falls or Mosi-oa-Tunya is consider the largest waterfall in the world with the size of up to 1,708 metres (5,604 ft) wide and 108 metres (354 ft) high and is twice the height of Niagara Falls. It is located in between Zambia and Zimbabwe, Southern Africa. David Livingstone discovered the majestic waterfalls in the 19th century and has been the tourist attraction since then and established itself as a premier tourist destination in the 21st century. The falls is famous for its natural formed pool known as the Devil's Pool, near the edge of the falls, accessed via Livingstone Island in Zambia. During the months of September to December, the river flow is at a certain level, usually a rock barrier forms a pool with little current where people can swim. Victoria Fall offers a great range of activities to tourists such as water rafting, elephant back safaris, tour of the falls, shopping, canoeing, high wire activities, helicopter flight, bungi jump and more. There are lots of hotel accommodations in the area, among the recommended hotels are the Ilala Lodge, A’Zambezi Hotel is recommended for tourist, Victoria Falls Safari Lodge, Lokuthula, Amadeus Gardens, the Rainbow Hotel, The Kingdom Hotel and more. Shops, booking offices and eating places are located everywhere too. For visa requirement visitors should check should check the rules before crossing the border or confirm with the embassy for the required visa needed.You can also check the zambiaimmigration.gov.zm but please note that information posted can change without notice. Traveller’s cheques are not widely accepted so make sure to bring US$, some local currency and ATM card. ATM machines are available at the airport and in in the centre of Livingstone town . For precaution, wear long trousers and long sleeved shirts in the early morning and evening and wear insect repellent to prevent you from insect bites. I'm always left in awe at nature's wonders. This is one of them. I wonder if I can go there in this lifetime. Simply beautiful and amazing! Would love to visit this fall as I'm really amazed with waterfalls and its beauty. God made wonders. How wonderful it is! Hey guys! I came across with this page, and if you don't mind me sharing I remember the Jim Jim Falls in Darwin where kakadu tours are famous. It's just so amazing to watch a gigantic waterfalls right before your eyes. Isn't it? There's no structure unlike a waterfalls that feels like a dream and especially victoria falls which is so large. It must feel like a dream being there. In addition to its width, if this falls is twice the height of Niagara Falls, then its really magnificent. I have seen the Canadian side of the Niagara falls and I was already amazed. This is a dream destination for nature lovers! whenever i go to nature trips, i really make sure to wear long sleeves, long pants and closed shoes because i'm so scared of getting bitten by insects etc. i love seeing waterfalls in pictures, but seeing them in real life scares me. i guess seeing all the water rush down makes me feel powerless. Great information, :-) Hoping someday i could visit this wonderful nature. Thanks for the tips already noted.. I've always wanted to visit this! Humanda ang Victoria Falls. Pupuntahan ko talaga ang Africa! I'll probably cry a waterfall just seeing Victoria Falls for real. It's indeed a dream destination for everyone. I love the photo. I've always adored the sights of waterfalls. They are so majestic! It will be a dream come true for me if ever I can visit this enchanting place. Hopefully someday, we can.